Registrants for the congress were admitted free of charge to The European Fine Arts Fair (TEFAF) at the MECC, Maastricht. Following the opening weekend of the TEFAF, CODART and its friends were invited to a reception and buffet dinner by the Bonnefantenmuseum in Maastricht. Avenue Ceramique 250, T +31 43 329 0190. F +31 43 329 0199. Our hosts were the director, Alexander van Grevenstein, and our member Peter van den Brink. Participants who came early were able to see the current exhibition: Dürer and his time: German prints and drawings from the Renaissance. The museum was kept open after closing for CODART and its guests. The opening session took place at Huis Osterrieth, an 18th-century mansion at Meir 85. This is the Antwerp headquarters of the Artesia Bank, which was our host and main sponsor. Entrance was through the front door and the staircase to the Kolonnadezaal. 9:30 Welcome by Gary Schwartz. 9:40 Dr. Ad Koekkoek, Netherlands Ambassador for International Cultural Cooperation, acknowledged the importance of the work of curators of Dutch and Flemish art from the point of view of Dutch cultural diplomacy. 10:00 Mr. Wilfred Vandaele, Secretary-general of the Committee for the Netherlands-Flemish Cultural Treaty, provided an overview of cultural projects involving the two countries. 10:20 Dr. Wim Blockmans, professor of medieval history at Leiden University: The Spanish Habsburgs and the Netherlands. The focus of the talk was the image in art of Charles V and his deeds. The emperor emerged as a late and passive subject for artistic propaganda and image-building. 11:30 Dr. Pilar Silva, curator of early Netherlandish painting at the Prado: Les primitifs flamands en Espagne. A sketch of the introduction into Spain in the 15th century of Flemish art, artists and styles. 12:15 Dr. Arnout Balis took the place of the announced speaker, Dr. Alexander Vergara, who was taken ill the day before the congress. Balis spoke on Rubens and Spain. His discussion of the Adoration of the Magi in Madrid was an excellent preparation for the study trip. Museum Mayer van den Bergh, a seldom visited small museum with extraordinary holdings in 16th-century Flemish art, beginning with Brueghel’s Dulle Griet and Twelve proverbs. Lange Gasthuisstraat 19, T +32 3 232 4237 | F +32 3 231 7335. Our host was the director, our member Hans Nieuwdorp, who introduced the museum briefly and then left us to relish it on our own, on a day it was closed to the public. Participants were invited to visit the Center for the Study of 16th- and 17th-Century Flemish Art and Rubenianum. Kolveniersstraat 20, T +32 3 201 1577 | F +32 3 231 9387. 16:00 Talk by Arnout Balis, associate of the Center and editor of the Corpus Rubenianum Ludwig Burchard, on the history and currrent activities of the Center. 16:30 Tea. Guided tour through the facilities by our member Nora De Poorter, associate of the Rubenianum. The Artesia Bank invited us for drinks at the American Belgian Association, a private club off a charming, closed courtyard at Venusstraat 17. This atmospheric location, a 16th-century building which was turned into an American club in 1948, was at our disposal for the entire evening. Telephone +32 3 232 9216. Fax +32 3 226 3796.We were also able to make use of the adjoining Hollandse Club. The president of the club, Arthur Bonemeijer, was present at the reception. The Artesia Bank graciously offered the congress participants dinner at the American Belgian Association. Representing the bank was Jan Martens, director of the publishing house Mercatorfonds. A special guest at the dinner was Jos Van Rillaer, secretary-general of the Ministry of Culture of the Flemish Community. Committees were set up for aiding the organization in key areas. Presentations by members on their own museums and projects were given. Sanda Marta spoke on the history and holdings of the Brukenthal Museum in Sibiu, Romania. Her slides alone were a convincing demonstration of the high quality of the collection. Peter van den Brink reported on initiatives undertaken by the Bonnefantenmuseum following on encounters at CODART TWEE. The museum has exhibitions and other projects planned with the Brukenthal Museum, the National Museum of Romania, Prague Castle, the Michaelis Collection in Cape Town and the Fogg Art Museum. Van den Brink emphasized the role of CODART as a platform for meetings between curators from eastern Europe and their colleagues in the west. Dorota Dec introduced the Czartoryski Museum in Cracow, the oldest museum in Poland. Maria del Carmen Rippe Moro gave a brief presentation on the National Museum in Havana, Cuba. Hans Fransen spoke briefly on the Michaelis Collection and an altar panel it is lending for exhibition in Maastricht, Karlsruhe and Kassel. The building where we met houses part of the art collection of the Artesia Bank (formerly the Banque de Paris et des Pays-Bas or Paribas). Before lunch we had the opportunity to visit this rich collection, a pioneering initiative in corporate art collecting. We were greeted by Jan Martens, director of the prestigious publishing house Mercatorfonds, which was likewise stimulated by the bank and which has its offices in the building. All in attendance were presented with copies of a splendid publication on the collection, in a Dutch or French version, edited by Arnout Balis and Piet Coessens: Kunst in de bank: een keuze van Rubens tot Magritte, Antwerp (Mercatorfonds) 1997. Free time for visits to museums and exhibitions in the city. Koninklijk Museum voor Schone Kunsten, Leopold de Waelplaats, T +32 3 238 7809 | F +32 3 248 0810. Discussion in auditorium of museum on effectuating a Dutch-Flemish union in CODART. Our host was Paul Huvenne, director of the museum, board member and regular member of CODART. An introduction to the theme was provided by Gary Schwartz, director of CODART. Speakers: Piet Holthuis, secretary-general of the Netherlands Ministry of Education, Culture and Science, representing Rick van der Ploeg, State Secretary for Culture. Holthuis stressed the importance of international cultural networks and the support they receive from the Dutch government. At the same time he emphasized that such networks by their nature must be supported in the long run by more than one country. Walter Moens, co-chief of the cabinet of Bert Anciaux, Minister of Culture of the Flemish Community, representing Minister Anciaux. Moens announced that the minister had been briefed on CODART and that he stood behind the plan for joint financing by the Netherlands and Flanders. He added that the Flemish government will want to provide accents of its own for the program, notably support for exhibitions. Luc Devoldere, editor of the publications of Stichting Ons Erfdeel (Our Heritage), provided a capsule history and characterization of an institution that operates successfully as a Dutch-Flemish cultural foundation with financial support from both government. The talks were followed by a brief forum discussion between the speakers, with questions from the audience. Koninklijk Museum voor Schone Kunsten Antwerpen. The reception was offered to us by Mr. and Mrs. David van Iterson. David van Iterson is the Consul-General of the Netherlands in Antwerp. Arrival in Malaga , transfer by bus to Hotel Tryp Albayzin, Carretera del Genil nr. 48, Granada. T +34 958 220 002 | F +34 958 220 181. Because it was raining, we kept the bus to cover the few blocks to the Capilla Real, which we reached at 5 p.m. There were met by a local guide who took over for the afternoon visits. Apparently arrangements of this kind, which remove parts of the program from control, are inescapable. In January 1492, after eight centuries of Moorish rule, Granada became a Christian city, the last in Spain to fall to the Reconquista. The Moors and 400,000 Jews were expelled from the realm in an act of ethnic cleansing from which Spain has never recovered. In the lower city, the Nasrid mosque, baths and neighboring buildings were demolished to make way for the royal funerary chapel of the Catholic Kings, Ferdinand of Aragon and Sicily and Isabella of Castile and Léon. This was the Capilla Real, constructed between 1505 and 1521. It still houses the remains of Isabella’s splendid art collection, including major works after Rogier van der Weyden and by Dieric Bouts and Hans Memling, as well as paintings by Botticelli and Perugino. None of the participants could think of another ensemble of this kind: a 15th-century collection of 15th-century Flemish paintings. The tombs of Ferdinand and Isabella, by the Italian sculptur Domenico Fancelli, is considered to have introduced the Renaissance style into Spain. Also buried here are their daughter Joanna the Mad and her husband Philip the Fair, the parents of Charles V. “The ornate interior of the Capilla Real, with the royal tombs, the great retable by Felipe Vigarny (1521), the fine grille and the superb collection of paintings, make it one of the most important historic and artistic buildings in Spain.” (Dictionary of Art). Unfortunately the great retable was being restored during our visit. Upon his accession in 1526, Charles V developed an ambitious plan to make Granada the center of an empire. The Cathedral, which had been begun in 1523 in Gothic style to plans by the architect of the Capilla Real, Enrique de Egas (Hendrik van Eyck), was accordingly revamped by Diego de Siloé in a classical mode intended to evoke ancient Rome. The Capilla Mayor, a two-storied rotunda with an ambulatory, resembles in this the great court chapel of Charles the Great in Aachen. The group split up. Those who stayed with Lourdes were taken through the streets of an old Granada neighborhood with fewer tourists than downtown or the popular Albaicín. We ate well in a bright and friendly tapas restaurant on the Campo del Principe. Fortunately, the Catholic Kings did not see fit to destroy the Moorish palaces on the fortified hill overlooking Granada, the Alhambra. They held court in this wonder of Moslem architecture. The Alhambra was a royal city, with state apartments, living quarters for the chief courtiers, mosques, baths, barracks, cemeteries, administrative pavilions, schools, gardens and courtyards. The surviving elements, with their fountains and carved calligraphy and transitions from closed spaces to porches to open patios, are still one of the most enchanting environments on earth. Our guide Eduardo was a professor of modern history at the University of Granada. He provided excellent information and was able to answer our questions with authority. The weather had cleared up; it was cool, cloudy and breezy. There were other groups visiting, as always, so that we had to wait our turn here and there. Not that the Catholic rulers of Spain neglected to leave their mark on the Alhambra. Charles V leveled a small part of the royal apartments and a cemetery to build a Renaissance palace around a two-storied (Doric and Ionic)rotunda! The palace covers 3,600 square meters, about the same surface as the adjoining Nasrid palaces. The groundplan is a circular courtyard within a square of four wings, an exceptional configuration for which Eduardo knew no precedents on this scale. The contrast between the rarified, various and randomly linked Islamic spaces with their poetic and religious texts and the overorganized, hierarchic, historicizing power palace of Charles is a delectation in itself. Our visit to the Alhambra began in the palace, going on to the Alcazar, then the Alhambra and finally the Generalife. Taken jointly (food included, drinks extra) at the Restaurante Las Tinajas, Martinex Campos 17. T +958 254 393. The food was good and the service outstanding. We were back in the bus in an hour. We met our local guide outside the city wall. She took us through the maze of small streets close by the Mezquita, once the Jewish quarter, to the single surviving synagogue of medieval Andalusia. The mosque of Córdoba was built in the 8th century and expanded in the 9th and 10th by the emirs of Al-Andalus at a time when the city was one of the greatest in the world. With a reported half a million inhabitants (nearly twice the present population)it had a level of literary and artistic culture unrivalled elsewhere in Europe or the Moslim world. The Great Mosque was a legend from the time of its creation and has remained so. After the reconquest by Ferdinand III in 1236, Córdoba went into decline until the union of Castile and Aragon in 1469. Its recovery was sparked by the wool trade with the Netherlands. Under Charles V the city fathers attempt to bolster the position of Córdoba by building a cathedral in the middle of the Mezquita. The results are said to have dismayed the man who built his palace on the Alhambra. There is another way of looking at it: the cathedral adds a surrealistic effect to a building which was so perfect that its impressiveness could be enhanced in no other way. The Mezquita was not at all as crowded as the Alhambra. Moreover, its unfenced interior allows you to wander at will, unlike the fixed route of the Alhambra. Our guide took us through the various sections of the mosque in chronological order, pointing out details of design and workmanship specific to the period of construction. Flanking the Mezquita is the Patio de los Naranjos. The Patio of the Oranges (which does not belong to the royal family of the Netherlands)is the oldest Moorish garden in Spain. The pride of the Spanish railways is the fast train from Seville to Madrid, the AVE. If it arrives more than 5 minutes later than schedule, the railways guarantee restitution of the full fare. We had tickets for the train leaving Córdoba at 19:43. However, after we had checked in our bags – another excellent service of the railways – we discovered that the 19:43 was “suprimido” – cancelled – on account of a labor dispute. Under these circumstances the railways do not feel obliged to return the fare or even to stand the passengers to a beer. Fortunately we were able to take the AVE of 20:43, arriving around 22:30 in the city which Philip II made the capital of his empire. The near-disaster was taken in good spirit. Dinner at Gran Mesón Sixto, a plain Madrid tavern in a back street, but with some of the best tapas in the city. While we ate, our bags were brought to the hotel by Lourdes and a transfer agent of Mundicolor, the Spanish travel agency that handled arrangements on the ground. Hotel Tryp Capitol, Gran Via 41. (T +34 91 521 8391 | F +34 91 521 7729) The three-star hotel is located on a Baron Haussman-like boulevard on the edge of the historic center of Madrid, within a few blocks of the 16th-century Plaza Mayor and the 18th-century Puerta del Sol. The Capitol is slightly shabby and the elevators and lobby space are insufficient. But the rooms and beds are comfortable, the breakfasts generous and the location perfect, except for the fact that there was no parking space for the bus. On occasion the bus driver had to drive around the block while waiting for us. First group of 12 to visit the collection of the Duquesa de Alba at the Palacio de Liria, Calle Princesa 20, a short walk from the hotel. The richest private holdings of Dutch and Flemish painting in Spain. The collection today contains works acquired mainly by the Gran-Duque, Don Fernando Alvárez de Toledo (1507-82; including portraits commissioned by him from Titian and Anthonis Mor); Duque Carlos Fitz-James Stuart y Silva, the 14th Duque de Alba (1794-1835); and the 17th Duque de Alba, Jacobo Fitz-James Stuart y Falcó (1878-1953). The archive includes such items as the logbooks of Christopher Columbus on his voyages to America. Second group of 13 to visit the Palacio de Liria. These early visits were allowed by way of exception, only after a special request had been submitted to the Duquesa by a highly-placed intermediary and friend of the family. The numbers were strictly enforced by the guard, who kept the second group waiting outside the palace until the first group had left. A few members of our party had to be disappointed. The guide, Isaac Pescador Sesmero, spoke little English but was helpful and friendly. Each of our two groups included Spanish speakers who could serve as interpreters. Even had we wanted a group tour of these incomparable museums, which I am sure CODART members do not, it would not have been feasible: the Prado admits groups for an hour and a quarter maximum, the Thyssen for two hours. We visited the museums on our own. At 4 p.m. we were greeted in the lobby of the Thyssen-Bornemisza by the director, Dr. Thomas Llorens. We spoke to him for a quarter of an hour about the museum and CODART. This foundation, devoted to cultural contacts between Spain and the Seventeen Provinces of the Netherlands, comes closer to the aims of CODART than any other institution in Spain. The foundation dates from 1594, when an Antwerper in Madrid dedicated several buildings in Madrid for the use of poor pilgrims from the Seventeen Provinces. In 1988 the King of Spain allowed the foundation to change its charter from social to cultural purposes. The ambassadors of the Netherlands and Belgium are on the board, as well as the director of the Prado, Dr. Fernando Checa. We were received by the foundation in its exhibition space, the former church of San Andrés de los Flamencos, Calle Claudio Coello 99. In the apse hangs Rubens’s Martyrdom of St. Andrew, commissioned for the foundation in 1635 by one of its donors, Jan Van Vucht.The foundation and the ambassadors invited colleagues from the museums and universities of Madrid as well as cultural officials, diplomats, writers, journalists and artists to meet us. The reception was sponsored by the Brussels art dealer Jan De Maere, who could not be present. The extraordinary night life of Madrid did not disappoint the participants. Lourdes took us to the Puerta del Sol and the Plaza Mayor before we repaired to the convent of the Descalzas Reales, where we were admitted before opening hours at 10:15. Having been founded by Joanna of Austria, the daughter of Charles V, in the palace where she was born, it remains to this day a royal establishment and falls under the supervision of the palace. Among the treasures from that time are ten tapestries after designs by Rubens. We were greeted and shown around by the curator of collections of the convent, our member Ana García Sanz of the Patrimonio Nacional, who had keys to spaces not open to visitors. The convent of the Incarnación had to be taken off the program; when we made the appointment, no one recalled that March 25th is the day of the Incarnation, the only day in the year when the convent is closed. This was just as well, since we spent three entire hours with Ana García Sanz , staring our eyes out at the extraordinarily rich mixture of architecture, painted decoration, liturgical furnishings, art treasures and relics in the Descalzas Reales. On Christmas Eve 1734 a fire destroyed the palace of the Habsburgs, which incorporated elements going back to the 9th century. The Bourbons built their palace on the site in 1738-57. The collections include royal portraits by Goya as well as some remains of the Flemish collections in the old palace. The main connection with the lowlands – a more important one to the Habsburgs than their paintings – is to be found in the armory, with arms and armor mainly from northern Europe. Unfortunately, this was closed for a lengthy period of re-installation at the time of the visit. We were guided through the palace by Pilar Benito García, curator of the Palace for the Patrimonio Nacional, which has its headquarters there. Philip II’s mausoleum, monastery and palace, on a groundplan said to be a monumental grill for St. Lawrence, to whom the monastery is dedicated. Whether or not one can speak of direct quotation, the complex bears comparison only with such other structures as the Temple of Solomon or St. Peter’s and concepts like St. Augustine’s City of God. It was here that Rogier van der Weyden’s Crucifixion and Bosch’s Garden of Delights and Haywain were brought by Philip II. El Escorial is an eternal paragon of spiritual grandeur in architecture. In its present arrangement for touristic visits by groups much of the effect is lost. The halls with Flemish paintings nonetheless made a deep impression. On the suggestion of several participants, we squeezed in an unscheduled visit to this Hieronymite church and cloister across the Eresma River from Segovia. Alistair Boyd’s remarks in the Companion Guide to Madrid are well taken: “The church has been restored by Bellas Artes and the doorways, chapels, recesses and tombs stand out almost like exhibits from the walls, which have been picked back to brick.” The retablo was treated equally questionably in the other direction: it is covered with 20th-century polychromy. The view from the cloister was spectacular. The heaviness of El Escorial was felt by the successors of the Habsburgs in Spain, the Bourbon dynasty, as excessive. They turned to French models and artists for inspiration and relief. We too took relief from El Escorial by finishing the day at the gardens of La Granja de San Ildefonso, the most beautiful in Spain. The palace itself is closed for renovation until June 2000. The extraordinary tapestries after Bernard van Orley are presently in Mechelen, being restored for the exhibition Los Honores opening there on 25 May. Because of the extra time we took in Segovia, we did not arrive at La Granja until half an hour before closing time. The group who stayed with Lourdes was taken in hand by the Patrimonio Nacional intendant of the palace, who spent an hour and a half with us touring the gardens and explaining the program of the (empty) fountains. The others were unfortunately turned out and had to spend the time in the cafes of San Ildefonso. The twilit sky over the country road we drove on the way to the main highway provided an added delight. We were admitted to the museum on the closed Monday at the low Goya entrance across from the Ritz Hotel. There we were awaited by our members Alexander Vergara and Pilar Silva. With the Prado to ourselves, we first followed Dr. Vergara upstairs to the Dutch and Flemish rooms. He provided a fascinating running commentary on issues of museology and display, conservation, loan decisions, attribution, institutional history and recent scholarship. With Dr. Silva we visited the early Netherlandish rooms on the ground floor, where she discussed the acquisition history and critical fortunes of individual paintings. 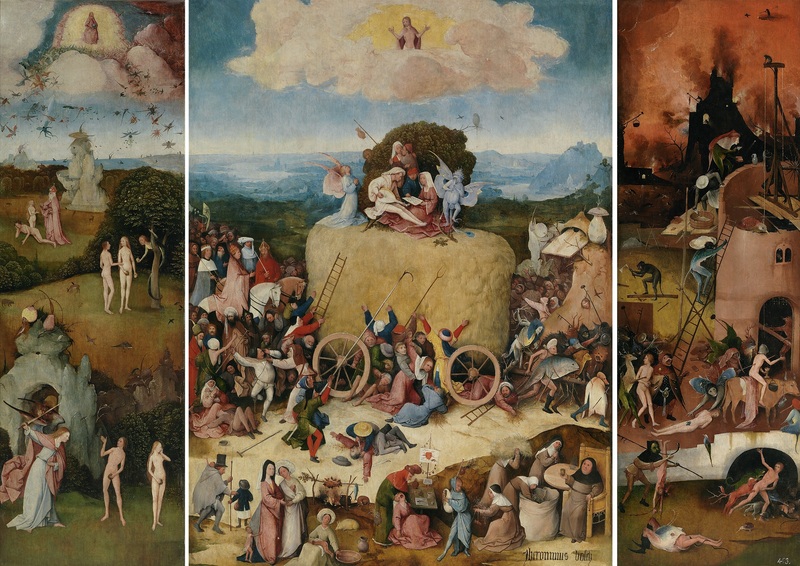 In the extraordinary room with paintings by Hieronymus Bosch, Paul Vandenbroeck provided a brief and convincing interpretation of the Garden of Earthly Delights, distilled from his own voluminous writings on the painting. Accompanied by the Prado curator Rocio Arnaez, we were guests for lunch at the home of Mercedes Royo-Villanova, trustee of Museo Lázaro Galdiano, and her husband Mr. Jose Luis Alvarez, member of the Academy of Arts and of the Patronado of the Prado. The Alvarezes have a small collection of old master paintings, mainly Flemish and Dutch. Their most unusual painting is a Last Supper in the composition of Leonardo da Vinci, published by Mattias Diaz Padron as a van Dyck after a drawing of the Leonardo by Rubens. Avenida de los Madroños 4. T +34 91 759 2130. F +34 91 435 4049. Thanks to Ms. Royo-Villanova, we were admitted on the closed day to the Museo Lázaro Galdiano, a remarkable museum that came forth out of an encyclopedic private collection built in the second quarter of the 20th century. Ms. Royo-Villanova is working on a catalogue of the Dutch and Flemish paintings in the museum, and she was able to draw on the expertise of our members for opinions on attributions. The ambassador of the Netherlands, Count Jan Mark de Marchant et d’Ansembourg and his wife Nicole, offered the group a closing dinner at the embassy residence, Isla de Oza 24. T +34 91 316 4245. Among the other guests were the ambassadors of Belgium and Luxembourg, the director of the Patrimonio Nacional, the Duque de San Carlos and the Prado curator Juan Luna, who curated exhibitions in Spain of the Utrecht school and the Haarlem school. The evening was enlivened by magic tricks performed table by table by an old friend of the d’Ansembourgs, Venda Dobrzensky. The Imperial City from 1520 to 1560, when Philip II moved the capital to Madrid. The groundplan and buildings of Toledo incorporate all the great periods of Spanish culture: Roman, Visigoth, Moorish, Reconquest and Habsburg. One can still sense the differences between the Moslem, Christian and Jewish quarters of medieval Toledo. Our visit to the Cathedral was a high point of the day. In the bus on the way to Toledo, Ronda Kasl told us about the heavy contribution of Flemish architects and sculptors to the building and decoration of the main church in Spain. In fact, many views of the building and situations in the interior seemed entirely Flemish. Workshops of Flemish craftsmen dominated the fabbrica for generations in the mid-15th century. Hans Nieuwdorp seconded Ronda’s opinion that the Cathedral of Toledo presented more integral ensembles of Flemish ecclesiastical art than in any post-iconoclasm church in Flanders. The sacristy still houses El Greco’s first institutional commission in Spain, El Espolio, The Disrobing of Christ, and the artist’s series of the apostles and evangelists as well as other wonders, such as Moorish banners captured during the Reconquista. Tearing ourselves away was made only slightly easier by the godawful reli-Muzac coming out of loudspeakers all over the church. Following a lunch break we visited the Iglesia de Santo Tomé, with El Greco’s Burial of Count Orgaz. Before entering the Jewish quarter, Gary Schwartz gave an outdoor exposé on Kabbalism in medieval Spain. The group then visited the 14th-century Sinagoga del Transito, which now houses the Museum of Sephardic Jewry. Some also took in the 12th-century synagogue, now known by the interesting denomination Sinagoga da Santa María la Blanca. The final visit was to the Franciscan monastery of San Juan de los Reyes, another product of Flemish architecture in Spain. IB 3208 departed at 20:00 for Brussels, arriving at 22:15; IB 3244 departed at 20:10 for Amsterdam, arriving at 22:30. Everyone reached home safely.